I am normally an Urban Threads girl, but I really love these stacking dishes from Embroidery Library. I brightened up the colors some so they really seem to ‘pop’ on the fabric (and made sure that I used a water soluble topper so they threads don’t sink into the terry)…. I’m going to have to find more things to use this design on, it’s just too cute! This entry was posted in General on June 30, 2014 by stacy. I’ll admit it, I don’t make (or wear) enough dresses. This spring I vowed that I would (attempt to) sew more. First up, the Jorna Tank Dress! This pattern appeared in the latest Perfect Pattern Parcel and I loved the fact that it looked easy to sew and comfortable and flattering to wear – plus it had an interesting hemline! I searched my stash for the perfect knit and had a bit of problem finding one that I liked in the ‘correct’ yardage. I wound up using a beefy, cotton knit that I had picked up from The Fabric Fairy quite a few years ago, but had never used because it’s EXTREMELY thick and has very littleno drape. Consequently, I wound up having to make a few design changes to the pattern – mainly eliminating the facings, trimming the seam allowance down in the necklinearm areas, and top stitching them in place (instead of using the self facing), as well as shortening the length just a bit. The end result is a very cute dress (don’t mind my scrunched up face in the picture, the sun is in my eyes) that is easy to wear. This entry was posted in General on June 27, 2014 by stacy. Have an over-sized t-shirt and 45 minutes to spare? Then you can whip out this cute Hippitee-Do-Dah bag! Making your own underwear is easier than you think. This tutorial not only teaches you how, but it’s a great way to use up some of those knit scraps you might have lying around. Transform a beach towel into a woman’s cover up! Sewing the Recital Dress couldn’t be easier – just a few measurements and rectangles and you’re on your way to a beautiful girl’s dress. Not sure what to do with those old cowboy boots? Why not make them into a purse? If it wasn’t for the fact that I live in one of the windiest states, I’d seriously consider making one of these Hammock Chairs to put outside. Recycle your old jeans into a fabulous weekender bag. Inspired by a Jimmy Choo design, the City Chic Handbag is a perfect summer accessory. Make carrying your make-up even prettier with this bow pouch. 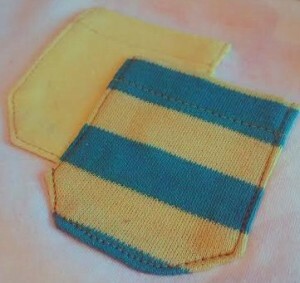 I don’t just love the name of the Paulie Pocket top, I love the kangaroo pouch that goes with it! Make a skirt so fabulous, you can wear it twice in a row…. because it’s reversible! This entry was posted in General on June 26, 2014 by stacy. Like many of you, I’m a sucker for great details. It might be an interesting back to a top, great lines in a pant, or in this case, tiny little micro pockets on a shirt. What am I talking about? 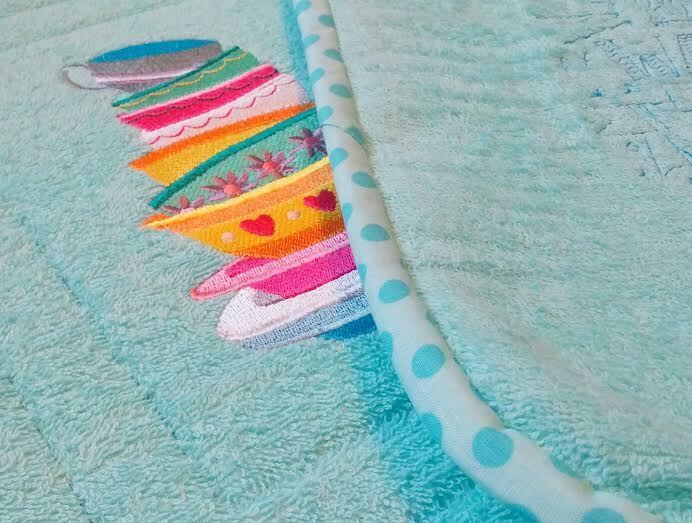 Sewing Cake’s latest (and free!) pattern, The Tee! Not only does this pattern have some great features and tips (I’ll talk about those in a second), but it’s easy to sew making it a great beginner project…. plus, did I mention it has tiny pockets? Probably the one thing that sets this tee pattern apart from others is that it’s ‘customized’ to your measurements before you even cut into you size. Basically you’re taking your measurements, plugging them into the pattern pieces, then ‘drafting’ the shapesize of your top (I use the term drafting loosely as it’s set up to just connect the dots to the sizelength needed). The other feature that I loved (obviously) are those tiny pockets! I didn’t just like how they’re stacked together perfectly, I LOVED how they were constructed: There’s a template for ironing, folks! Brilliant! 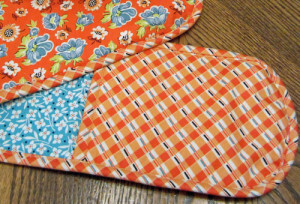 More patterns should do this because it really makes for crisp clean pocket folds (she also has a great tip for keeping your pockets from stretching out of shape when sewing – skip the pins and spray baste). 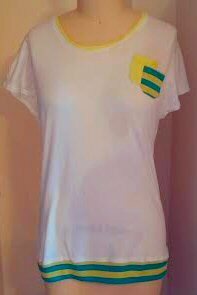 I have to say that I love my finished tee. I did make it a smidge too long (I thought I wanted longer until I was finished), but I tend to scrunch it up when I wear it so it works out well. The fit is perfect and I think that the fabrics give it a fun, retro vibe (unfortunately, my photos are a bit on the dark side today). I can definitely see making this one again (and again, and again)! This entry was posted in General on June 25, 2014 by stacy. With all the family that was born in June, it only stands to reason that the newest member of the family should be born this month as well! My brother-in-law’s son was delivered a few days ago, so I thought that my brother-in-law needed some baby gear that he wasn’t ashamed to be seen with. 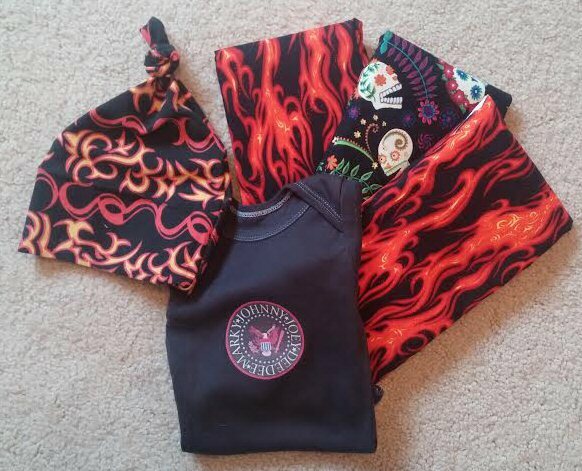 In addition to the burp rags that I had made several weeks ago, I whipped up a Ramones onesie and a Prudent Baby one knot hat (in a cool tribal flame print). I have to admit, baby gifts are one of my favorite things to make – I can’t wait to see our new little guy modeling these goodies! This entry was posted in General on June 24, 2014 by stacy. When I first posted about the Snappy Mani Pouch a few weeks ago, I knew this was going to be something that I would eventually make for a gift. Little did I know I would like it so much, I would sew it twice! 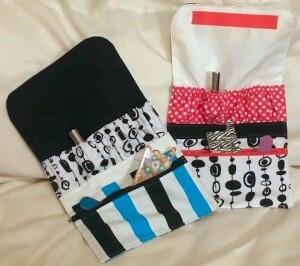 Initially, I thought this project would be rather time consuming so I only set out to make one – I was surprised to find that I could easily complete a pouch in just over an hour! The great thing about sewing these up is that they are great for using remnants from other projects and I had all of the notions on hand (I also went with a Velcro closure instead of a snap). The instructions were easy to follow and all the pieces came together without a hitch. Best of all the end result looked very professional so I’m definitely keeping this project in mind the next time I need to make gifts (I’m thinking this might be perfect for Christmas). I loaded my finished mani-pouches with pretty toe separators, polish, a mini emery board, and clippers plus a mini book on nail art ideas. The Bottom Line: I highly recommend this pattern! It’s easy to sew, even for beginners and the end result looks as good as what you would buy in any store. Best of all? It’s FREE! This entry was posted in General on June 20, 2014 by stacy. Get your kids to carry their own towel to the beachpool and wear it home with this fun Hooded Beach Towel Backpack. What’s better than a cute box tote? Making it reversible so it’s two bags in one! Did you see my latest tutorial at WeAllSew? Don’t miss the instructions to make your own Double Oven Mitts! I don’t normally decorate for the 4th of July, but I’m thinking that I definitely needing a Chevron Flag Pillow Cover. I’m not just attracted to the stripes on this top, but I love the style as well (you may need to translate for the full instructions). Pillowcase dresses are not just for little girls any more. Let your little one’s tooth sail away with this tooth fairy pillow. Perfect for holiday photos or just getting your little girl dressed for the 4th of July – The Star Spangled Skort. Love the idea of 30 days of sundresses? Your (grand)daughter can participate too – start off by sewing this adorable sewVery Sunny Dress. Make your little one a cute new romper (currently for 6 mo. sizing). Looking for a knit romper with a bit more size range? This free pattern goes up 12 months. Sewing a skirt couldn’t be easier. This tutorial shows you how… without a pattern! Turn your free Colette Pattern’s Sobretto tank into a stylish top with this tutorial and free sleeve pattern. Sign up for The Pattern Studio’s mailing list and you’ll receive a free skirt pattern. This swimsuit cover up is just for girls (but I secretly want one for me). This entry was posted in General on June 19, 2014 by stacy. This particular pattern was much easier to sew. In fact, I was able to have a completed toy from start to finish in just a long afternoon. However, it’s no Happy Stacker. 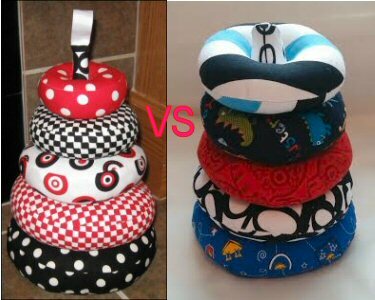 The most noticeable difference is the finished size of the toy – the Happy Stacker was almost as big as Easton at 5 months, while the Stacker Toy is substantially smaller. This also means that the ring size is also smaller, which isn’t necessarily a bad thing since I think that they are probably a little easier for smaller hands to hold. The Happy Stacker also has options for embellishments (such as ‘taggie’ type ribbons that hang off the rings), where the Stacker Toy does not (although, I think that you could easily add them to the pattern if you wanted to). The biggest difference (in my opinion)? The ‘quality’ of your finished product. I think that the Happy Stacker looks very professional – something that you could easily find in a baby boutique. The Ring Stacking toy, while looks fine, just doesn’t look as ‘polished’ – it’s not to say that I wouldn’t sew it up again, it’s just doesn’t have the same ‘wow’ factor as the Happy Stacker. This entry was posted in General on June 18, 2014 by stacy. In our family, June means birthdays. Lots, and lots, and lots of birthdays. That also means that in June, I sew a lot of presents! Consequently, the rest of this week will be devoted to some of the gifts that were sewn up for everyone! First up, my mom. She, much like me, loves to drink her morning coffee in fun mugs. 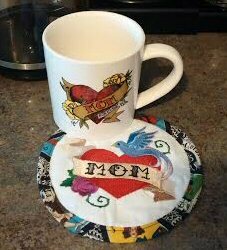 I stumbled across a ‘tattoo mom’ cup a few weeks ago (for those that are interested, I found it at World Market) and had to pick it up for her… of course, she needed a mug rug to go with it! I wound up using Urban Threads embroidery design for the center of the rug that was a pretty close to the design on the cup. To keep things interesting, I skipped the square shape of most mug rugs and went with a circle – I suppose that means it’s more of a coaster than a rug….. Afterward, I added a scrap of low-loft batting, backing, and a bit of binding to finish it off. This entry was posted in General on June 17, 2014 by stacy. If you haven’t stopped by Bernina’s WeAllSew lately, you’ll definitely want to drop by to see my latest project – the Double Oven Mitts. Not only will this glove protect your hands from burns, but your arms as well…. making it perfect for serving large casseroles, handling largeheavy pots, and getting those holiday turkeys and roast out of the oven! When you’re finished using your gloves, just hang them over the handle of your oven door so there’s never any need to search for them. These gloves whip up in no time, so they’re great for hostess gift giving, bridal shower gifts, or just to make a handful of them so you can change them out with the seasonsholidays! This entry was posted in General on June 16, 2014 by stacy.